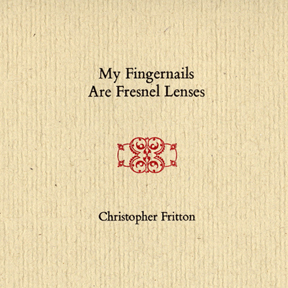 Christopher Fritton is a poet who wishes he was an artist who wishes he was a musician. He received a BA in Philosophy and a BA in Poetics from SUNY at Buffalo. Subsequently he earned his MA in Poetics at the University of Maine, Orono. He is the editor/assembler of Ferrum Wheel and the organizer of the Buffalo Small Press Book Fair. He lives and works in Buffalo, New York.